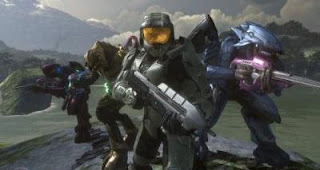 In just 24 hours, HALO 3 has become the biggest US entertainment launch ever, taking over $170 million (surpassing the previous record-holder: the movie SPIDER-MAN 3). Microsoft statement: "Not only is HALO 3 setting sales records, it's also redefining entertainment. Within the first 20 hours alone, we've seen more than a million Xbox Live members come online to play HALO 3, the most active day in Xbox Live history..."
The game is available in 3 Editions: the standard HALO 3 contains the game disc & manual. HALO 3 Limited Collector's Edition comes in a metal case with game disc, manual, interactive bonus disc, & a hardcover book with information & artwork. HALO 3 Legendary Edition has game disc, manual, 2 bonus discs with exclusive content, storyboard artwork, & a scale replica of the Master Chief's helmet!